M&D Mechanical had the opportunity of working with a pharmaceutical company on a particularly challenging project during the summer months of 2014. 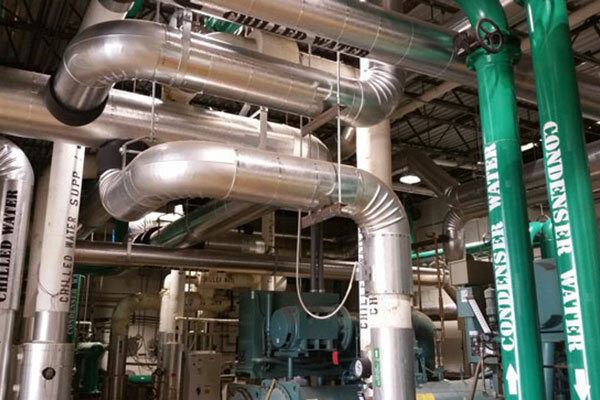 The project consisted of the construction of a building expansion that now houses a new 500 ton chiller, a designated 700 ton cooling tower, and a number of specialized pumps that allow for better efficiency and future capabilities of the facility’s chilled water system. Additionally, the scope of work involved a significant reconfiguration of the existing chilled water and condensing water piping loop that services the entire tablets manufacturing plant. All of the modifications, changes to existing piping arrangements, and incorporation of the new piping and equipment had to be carefully coordinated in order not to interrupt ongoing operations at the facility. The project allowed for the utilization of our CAD design team, prefabrication of piping components in our pipe fabrication shop, and a large contingent of onsite manpower. Our greatest resources of diligent and hardworking people successfully completed the project within the desired construction schedule and met the customer’s expectations in limiting manufacturing down time.